A dog that ‘begs’ for food may pester or poke his humans whilst they are eating. But many dogs are ‘silent beggars’. The just sit there, gazing at your plate, then back at you, then back at your plate again. As if they could ‘wish’ the food from your plate. If you have ever had a meal at a friends house whilst a dog sits next to you, eyes locked on your plate, a big string of drool dangling from the side of his mouth, you’ll know how off-putting it can be. It may seem obvious, but dogs do what works for them. If your dog is repeatedly begging at the table, it is because that behaviour has been rewarding for him at some point in the past. Some family member is accidentally feeding him from the table. 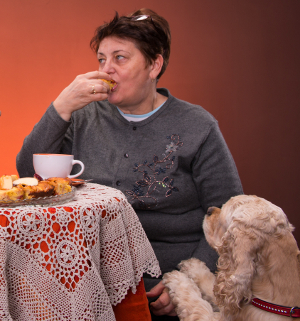 The former occurs when adults or children, openly or surreptitiously feed the dog. Passing food from their plate, possibly slipping food under the table to the dog. The latter is very common in families with very young children, who consistently spill, drop or throw food on the floor whilst they are eating. Saying ‘no’ or ‘stop that’ to the dog tends to have little effect on begging dogs. They may slink away for a while, only to creep back when you are not paying attention. Getting angry doesn’t help much either. Most dogs will risk a fair degree of wrath in exchange for a morsel of ‘forbidden’ food. In any case, from the dog’s point of view “Don’t do that”, is actually a very vague kind of instruction. If they are not supposed to ‘do this’ what are they supposed to do? We’ll have a look at that in a moment. But first, we need to stop rewarding the begging. Your first course of action must be to prevent the dog being reinforced (accidentally or purposefully) for the behaviour you want him to stop. In other words, you need to make sure no-one slips him food from the table, and that he cannot get at spilled food during the course of the meal. The easiest way to achieve this in the short term may be to exclude the dog from the room. An alternative is shut him in a crate in the same room. This is often the best option for a puppy. Don’t forget that puppies who are never fed from the table, will never learn to beg. If you don’t want to make physical exclusion a permanent solution, your next step should be to set about training the dog. Nowadays, dog trainers know that focusing on what you want to do, rather than what you don’t want the dog to do, is many times more effective. This works well for the dog too, because Dogs like to know where they stand and what is expected of them. The best option is usually to ask him to sit or lie in a designated place, well away from the table. You can use his bed, basket, or a mat of some kind. It needs to be a visually recognisable place so that it is clear to the dog when he is in it, and when he is not. You’ll also need to give the place a name ‘Mat’ or “Bed’ will do nicely. Your dog not only needs to know where he is meant to sit and stay, but also for how long. He needs to know when his time on the mat/bed is at an end. For this purpose you need a release cue. The dog will now learn that he must not move until he hears his release cue. Teaching a dog to lie in his bed or mat takes time. You need to build up duration gradually. And you need to begin at a time of day when there is no temptation to move. Start with a period of time that he can easily manage. This might be as little as 3 seconds to begin with. And wait until the rest of the family are out at work or in another room. You can lead the dog onto his bed by his collar, but the best way is to lure or shape him to go to bed. Reward the dog at one second intervals for three seconds then release him. Build the duration up very gradually, remembering to intersperse rewards with big jackpots. Don’t keep going too long each time you have a training session, or you will risk him getting bored and wandering off! Make sure that your dog is happy to lie in his bed for the average length of time it takes you to eat a meal before exposing him to the ‘live show’. If you have any scraps left over for your dog at the end of a meal, take them to him in his bed before releasing him. If there are no scraps available, make sure you have a nice juicy treat waiting for him in the fridge. Give it to him in his bed to reinforce the behaviour of waiting in the bed. Then release the dog once the meal is done and cleared away. Begging at the table is an annoying habit, but it is easy to avoid and not too hard to cure. Make sure you never reinforce your dog around the table, whilst family members are eating, and he will never expect you to. Teach him that his bed is the place to be whilst you are eating. Build up slowly from a minute or two, to a full hour. Provided he is well exercised and has plenty of attention at other times, this won’t do him any harm. He will simply learn to fall asleep at mealtimes whilst you relax and enjoy your dinner in peace.